Each month, students in the Adult Basic Education program at Coastal Bend College come together for activity day, a shared learning experience outside of the traditional classroom setting. Typical activities include presentations from guest speakers, and participatory events such as science stations and multi-level spelling bees. When Program Director Roxann Gleason learned about ProLiteracy’s Keys to Safety Campaign, she decided to host an activity day dedicated to fire prevention and safety. Gleason’s interest in fire safety runs in her family. Her daughter, Heather Greenwell, is a physical therapist in the burn unit at Brooke Army Medical Center, a division of the United States Army Institute of Surgical Research located at Fort Sam Houston. When Gleason’s local fire department was not able to participate in the activity day, she contacted Greenwell for assistance. In preparation for the fire safety activity day, instructors used materials provided by ProLiteracy to teach basic fire prevention and safety. Students learned about escape plans and fire drills, smoke alarm installation and maintenance, and fire extinguisher use. Gleason also brought in a smoke alarm to demonstrate testing. Students had a chance to learn practical fire safety tips and ask questions in the comfort of their regular classroom, building interest in the topic and setting the stage for an informative guest speaker presentation. As instructors shared critical safety information with students, they began to pay more attention to safety precautions and processes in their own organization. This resulted in several improvements to the program’s overall safety plan. Staff tested the smoke alarms in the building to ensure that each was in proper working condition. For the first time ever, they developed an escape plan, complete with a safe outdoor meeting place. The plan was shared with students, and everyone participated in a program-wide fire drill. Program staff also noticed that there were no illuminated fire exit signs over the doors in the building. The problem was reported to the building administrators and the signs will be installed soon. With support from her colleagues at the Brooke Army Medical Center, Greenwell put together a presentation for the students and staff of the Coastal Bend College Adult Basic Education Program. She shared personal stories and images that provided approximately 40 attendees with a realistic understanding of the aftermath of a burn injury. She spoke of the challenges faced by her patients who are currently undergoing extensive therapy to regain skills and mobility lost to fire-related injuries, and of the impact access to physical therapy can have on the healing process. The Coastal Bend College Adult Basic Education Program plans to offer additional fire prevention and safety programming in the future. While Gleason’s daughter will soon be transferred out of state, it is likely that another representative from Brooke Army Medical Center will be able to participate in the event. Gleason plans to involve the local fire department in the next program. “This collaboration added a unique dimension to the fire prevention and safety activity day, and rounded out the basic fire prevention and safety tips the students learned in the classroom with a realistic look at the devastation a fire can leave behind,” Gleason said. For more information about Adult Basic Education at CBC Lott-Canada Facility, contact Roxann Gleason at (361) 362-2633. Coastal Bend College Lott-Canada Facility provides GED preparation courses for those interested in earning a high school equivalency diploma (GED). Classes are offered in reading, writing and mathematics to adults seeking to improve the basic skills necessary to function effectively in their personal and family lives, in the workplace, and in the community. Applications are being accepted now through Aug. 26 for the fall quarter which begins Sept. 6. Orientation for fall quarter will be held Aug. 30-Sept. 1 at the CBC Lott-Canada Facility at 900 W. Corpus Christi St. in Beeville. Those interested in attending GED or adult education classes must attend either the three-day orientation or the two-night orientation to be enrolled. During orientation, students will be given a skills test that determines their classroom placement. Students who are 16 years old must have a court order from a judge to register and 17-year-olds need to have parental consent and documented withdrawal from the last school they attended. GED and Adult Basic Education classes are also available in George West, Ingleside, Sinton and Taft. ESL classes are also available year round in Beeville for English language learners. 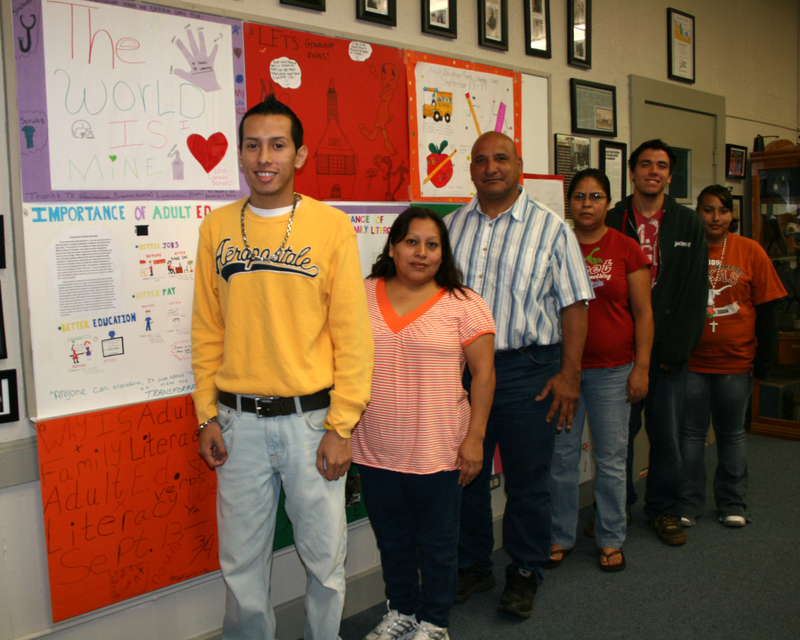 In celebration of Adult Education and Family Literacy Week, Adult Basic Education students at Coastal Bend College Lott-Canada Facility competed in essay and poster contests. Winners are, from left, Johnny Rangel for the best overall poster; Virginia Vasquez, first place; Joe Vera, second place; and Crystal Cantu, David Cantu and Anna Manzano, shared third place. In celebration of Adult Education and Family Literacy Week, Adult Basic Education students at Coastal Bend College Lott-Canada Facility competed in essay and poster contests. The best overall essay writer was Kelly Arzola (not pictured). Other essay winners are, from left, Reyes Gallegos won first place; Johnny Rangel won second place; and Kasy Owens and Joe Vera tied for third place.